We’ve had a few days of fall-like weather here in Oregon. I don’t know about you, when the fall weather kicks in I am ready for soup! 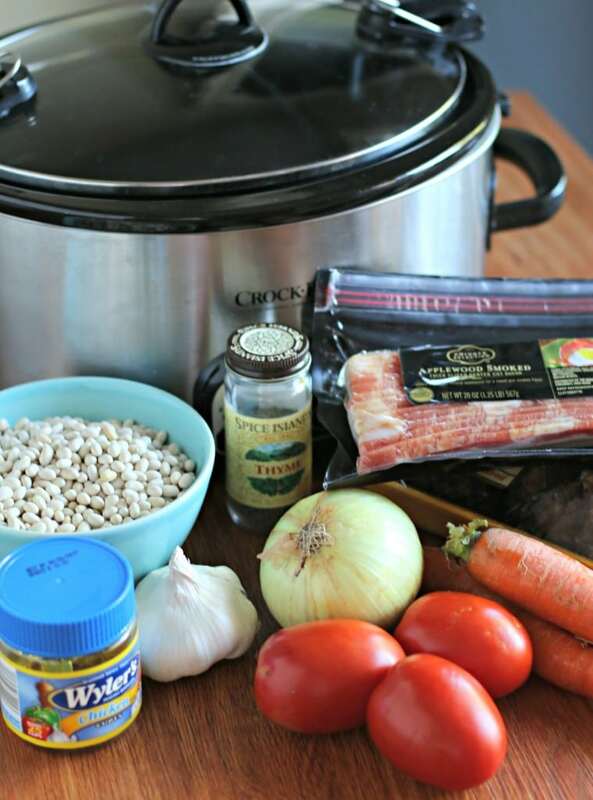 So I decided to make Slow Cooker Bean and Bacon soup this week. The recipe for Slow Cooker Bean and Bacon Soup is very similar to Bean and Ham Soup but with bacon. I thought for a second to leave out the ham hock; could there be too much pork flavor? Nope. I’m glad used a ham hock. It gave the soup a perfect smoky flavor. I also decided to try fresh tomatoes instead of canned for this soup and those turned out better than canned. The soup has a little prep work like soaking the beans, frying bacon and chopping vegetables. But really not too bad for homemade comforting soup! I also wanted to mention to not forget cornbread and butter. 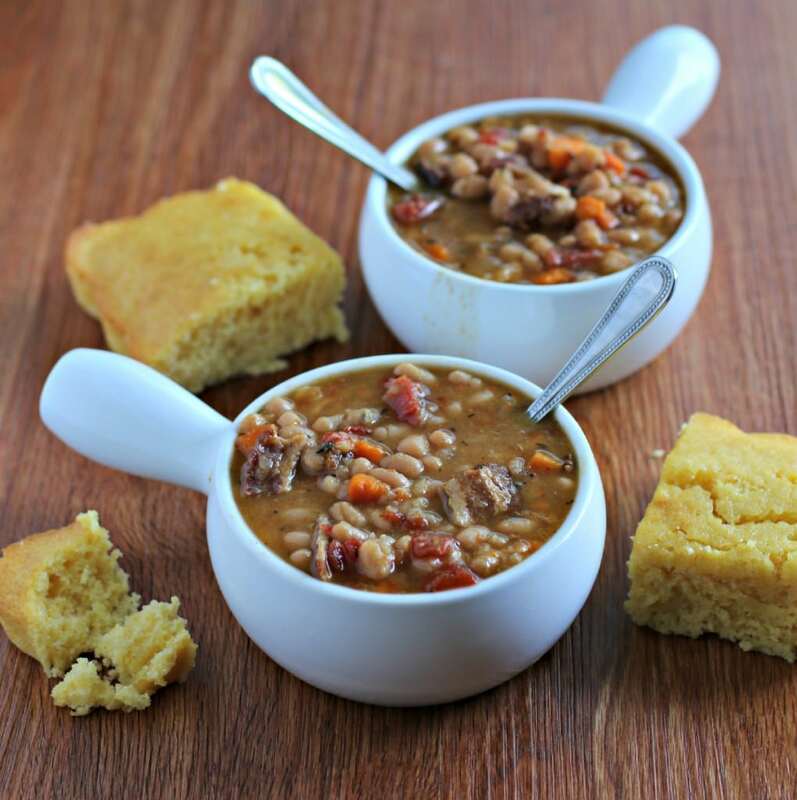 The sweet cornbread and butter compliment the smoky soup just right! The night before soak the beans. I do this by placing the beans in the slow cooker (sorting any rocks or dirt clumps out). Cover with water (about 4 inches of water above the beans) DON'T TURN ON THE SLOW COOKER YET! Let the beans soak in the water overnight. Drain the water off the beans in the morning. Add the fresh 5 cups of water, chicken bouillon cubes, onion, tomatoes, carrots, garlic, thyme, pepper, and cooked and chopped bacon. Stir. Remove the ham hock. Remove meat from ham hock and put into soup if desired. Stir, add salt to taste. Serve with cornbread and butter. This is the kind of soup that reminds me of my Dad. He called it navy bean soup and it was yummy. But as it is going to be 90 here again today I think I’m waiting on this one! This looks like comfort in a bowl right here! 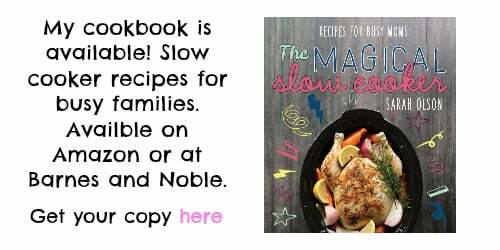 Love that it’s so easy with the crockpot! Definitely making this one soon! I agree with fall year round. Wow, Sarah! This soup looks amazing. I love that you used fresh tomatoes and the ham hock! It’s still VERY hot here in FL, but I’m pinning this one to try later in October when the weather finally starts to cool down. The second it cools down here, I am making this. Amazing!! I know we would love this soup! The flavors are great and it’s so hearty! Yum! Looks amazing and can’t wait to try it!! 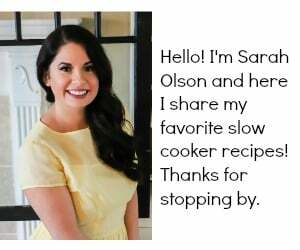 I did notice the carrots in front of the crock pot and in the soup, but it’s not listed in the ingredients or instructions. Is it two peeled and chopped carrots? If you mix a Jiffy cake mix and a Jiffy corn muffin mix together, follow the directions for ingredients on both, it turns out great. But I also recommend the Fleishman’s brand cornbread mix, it turns out so moist! I haven’t froze it before, I bet it would do fine. If I didn’t have a ham hock, I would throw in one of those 5 dollar ham steaks whole. And when the soup was done cooking you could dice it up and put into the soup. I saved the bacon for the end so it didn’t cook away. Yummy. This looks great, but do you realize how much sodium those bouillon cubes have. Why not use home made chicken broth or canned or boxed chicken broth? Much healthier. 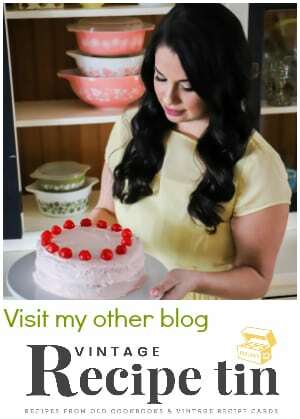 A recipe is always a suggestion or the way someone else did it ,but can always be modified to your own tastes and preferences…. What size are the servings? This was delicious I just used a mixed dried beans bag. YUM! Instead of 3 fresh tomatoes, would a can of diced tomatoes work? Wondering if anyone had tried this. Yes! I have personally done this. Works just fine! Don’t drain the tomatoes. My entire family liked this, which is a rare thing, so it will be added to the meal rotation. The only change I made was that I only used bacon, not a ham hock. Otherwise made it just as written, and it turned out perfect. Can you mix low temp and high temp to cook faster? If so, what would you recommend? I’ve had luck with beans cooking on high for 8 hours. You may be able to get away with 7 hours on high since white beans are so small. We made this for tonight–it was great! Plenty of flavor! I sprinkled shaved Parmesan on top when I served it, and I saved a few exta slices of bacon so we could sprinkle that too. 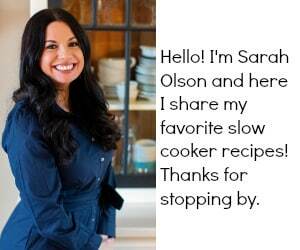 Thank you, Sarah for the wonderful recipe and photography! I was wondering if my church could use the soup photo for our “soup and cornbread supper” announcement slide Sunday morning? It’s perfectly thematic! We are prepping this now to put in the pot in the am so it will be ready when we get home from work. Thank you for sharing and looking forward to the yum!! Woot! Let me know how you like it Lee! Can you recommend something that supplies the pork flavor of the ham hock, but without the hock? Do the think the bacon would give enough ham flavor and add a little liquid smoke if we wanted a Smokey flavor? You could do diced ham too? Or just bacon and maybe a half teaspoon of liquid smoke. I made this with 2 ham hocks because that’s how the grocery store packaged them. This soup was amazingly delicious and rich. I’m making it for guests this weekend. Thanks for this recipe – 5 stars.